1. Preheat the oven to 400 degrees F. Prepare a baking pan with nonstick pan spray. 2. In a pie pan or shallow dish, mix the bread crumbs, cheese, basil or oregano, salt and pepper. 4. In another pie pan or dish, combine the egg and buttermilk. 5. Dip each fish fillet first in the milk mixture, then in the crumb mixture to coat both sides with crumbs. 6. 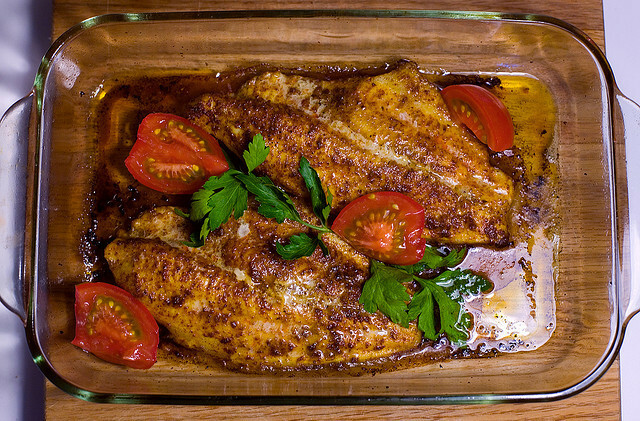 Arrange the fillets in 1 layer in the baking pan. 7. Bake 15 to 20 minutes, until the fish flakes easily with a fork.